4/5/2017–MOCKSVILLE, NC–On Saturday, 1 April 2017, the Sugar Valley Composite Squadron hosted the NC Wing Aerospace Education Day under the leadership of Lt Col Eric Orgain, NC Wing Director of Aerospace Education and Commander of NC-052. 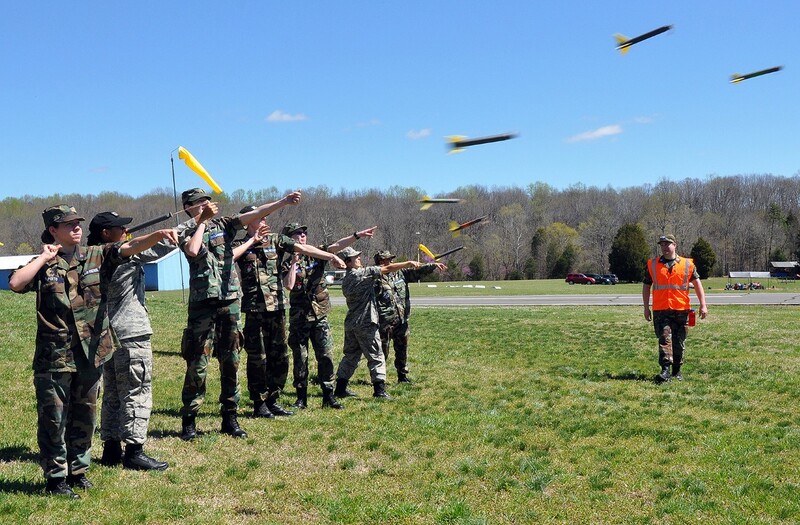 45 senior members and cadets from over a dozen squadrons gathered at the Sugar Valley Airport in Mocksville to explore rocketry, drones and virtual reality. Cadets chose to work on either rocketry or drones, and those interested in virtual reality were scheduled for 30 minute sessions to experience either the Oculus Rift or the HTC VIVE virtual reality systems. The drone track was led by Maj Stephen Leighton and Capt Doug Moody. Cadets learned the history of drones, the regulations for flying them, the types of drones and the possibilities of future careers flying and using drones. This was followed by actually flying a variety of drones and experimenting with precision flying - moving around a track and going under obstacles. The training for the afternoon involved ground team searchs for a practice beacon. The rocketry track was supervised by Lt Col Orgain, with assistance from Capt Joshua Waters of NC-301, Lt Gregory Larson of NC-019 and Lt Patricia Moody of NC-082. Cadets built two rockets: the Estes Alpha III and the Estes Viking. 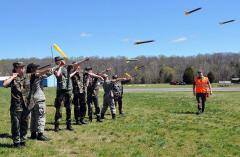 Cadets also completed the Redstone hands-on activities with fizzy flyer rocket and the Goddard rocket. The afternoon consisted of rocket launches, using the rockets that the cadets had built earlier that day. Each cadet successfully completed three launches. Cadets interested in virtual reality had the opportunity to work with the Oculus Rift VR system and C/SMSgt Ella Orgain guided participants through a virtual Apollo 11 flight. For those experiencing the HTC VIVE VR system, C/MSgt Caleb Padiak assisted cadets in Google Earth searches and virtual reality flight simulation. 1st Lt Todd Thornburg also had a room full of STEM kit flight simulators available, providing cadets the opportunity to practice their flying skills. It was a great day of learning and fun in aerospace education.